In less than a year from now – on March 29, 2019 to be precise – the UK is scheduled to leave the European Union. Although much of the political debate has been over the rights of citizens to move within Europe and the pros and cons of the Single Market, Brexit will also have an affect on our everyday finances. Here we look at how this might affect savings, business and credit cards in the UK. On May 10, the Bank of England announced it was not changing interest rates, which would stay at 0.5%, amid fears that the UK economy was too fragile to cope with a rate rise. This is good news for borrowers, including those people with credit card debt and mortgages, but bad news for savers. Consumer price inflation is currently at 2.5%, which means that the real purchasing value of savings is being eroded. Fitch, the ratings agency, said the household savings ratio (relative to income) was now 4.9%, a historical low. It forecasts that the UK base interest rate will rise gradually to reach 1.25% by the end of 2019. “The impact of the Brexit referendum on real wages may be fading, but Brexit uncertainty creates risks of a bigger shock to growth and employment,” it says in a Special Report “Weakening UK Household Finances Pose Risks” published on May 8. The value of your holiday pound, and the exchange rate you get when you use your credit card to spend abroad, are affected by foreign exchange (forex) fluctuations. 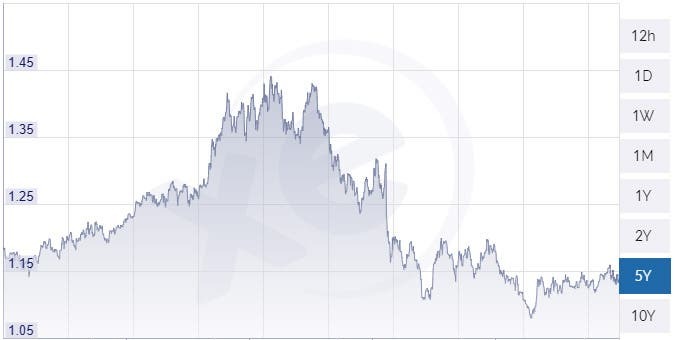 As of May 2018, sterling is worth just over 1.13 euros, compared with May 2016, when it was worth 1.3 euros, and July 2015 when it reached a ten-year peak of 1.44. Since July 2016 it has traded within a range of 1.08 to 1.12 and has recovered from its low of 1.07 soon after the Brexit result. When you make overseas purchases using your credit card or debit card, your provider applies a foreign currency conversion rate. This rate will be affected by the variations in the value of the pound, and any volatility in exchange rates. If the Brexit talks look as though the UK is failing to secure a good deal, sterling may fall again. The Bank of England may have to raise interest rates to protect the pound. While interest rates remain low, credit card companies are unlikely to increase their own interest rates. However, the era of rewards and benefits for holding a card seems to be at an end, says Andrew Hagger, founder of MoneyComms, the money information service. Until the Brexit deal is finalised, the government in the UK has to comply with EU directives. After Brexit, all existing European law will be incorporated into UK law. This includes a ban on credit and debit card surcharges and applies to all purchases made within the European Economic Area (EEA). It means airlines can’t add hidden charges for online bookings. There are unlikely to be any changes in the short term, as Teresa May has heralded this move as a victory for consumers. If you have savings with a bank or financial institution that goes bust, you’ll be compensated by the UK’s Financial Services Compensation Scheme (FSCS). The compensation limit is £85,000, equivalent to the €100,000 deposit protection limit in the EU. Similar terms are likely to be included in UK law when the changeover happens. Read more about compensation limits on the FSCS website. The EU put in place a 0.3% cap on credit card interchange fees that was aimed at reducing the cost of card payments. The UK Cards Association estimated that almost £900 million in savings should be passed onto consumers. Interchange is a fee paid by the retailer’s card acceptance provider to the consumer’s card issuer each time a card payment transaction occurs. The cap on fees applies on most product types within the European Economic Area (EEA). This will become law in the UK after Brexit, and is unlikely to change, says Andrew Hagger, of MoneyComms. There are still some concerns about the health of the economy, which is why the Bank of England decided not to increase interest rates this time. Brian Johnson, Insolvency Partner with the accountant HW Fisher, said that the economy had been affected by concerns over Brexit, and would continue to do so while the uncertainty remained. Behind the scenes, businesses were delaying decisions on investment and recruitment until the negotiations were concluded, he said, and there would be more insolvencies among businesses. This was not necessarily a bad thing, as poorly-run companies would be taken over by more efficient managers.